This window optimizes for the narrowest main lobe width for a given order M and sidelobe equiripple attenuation at, using Chebyshev polynomials. It was originally developed by Dolph to optimize the directionality of radio antenna arrays. and 0 <= abs(k) <= M-1. 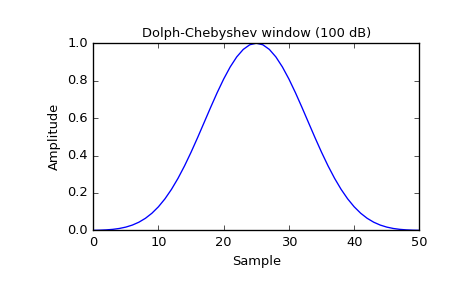 A is the attenuation in decibels (at). The time domain window is then generated using the IFFT, so power-of-two M are the fastest to generate, and prime number M are the slowest. 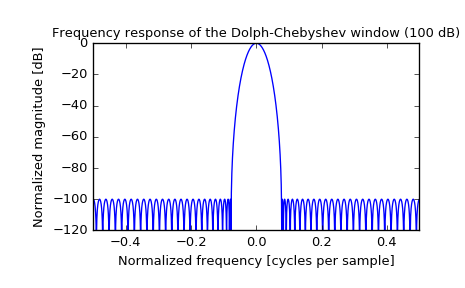 The equiripple condition in the frequency domain creates impulses in the time domain, which appear at the ends of the window.